The France 2 television channel has expressed its satisfaction with the audience figures from this year’s Tour de France, reporting that on average 3.6 million people watched the race on its channel each afternoon. Almost 15 million people watched at least one stage, and the numbers of viewers grew steadily during the three weeks. 3.2 million tuned in during the first week, with this number increasing to 3.8 million by week two and 4 million in the final week of coverage. “It is an overall result that is unchanged from last year and which is satisfactory in what is a more difficult competitive environment,” said the channel in a post-Tour communiqué. The big clash between Contador and Schleck helped spike the figures on the Tourmalet stage, the final day in the mountains. 6.5 million viewers watched, with this figure handing France 2 a 60% share of the French TV audience. The LeTour.fr website (the official site for the race) had over 14.4 million page views and more than 3.3 million visits. France did not have an overall contender this year, but its riders took a superb six stages. Victories went to Sylvain Chavanel (Quick Step, who took two), Sandy Casar (Française Des Jeux), Christophe Riblon (Ag2r la Mondiale), Thomas Voeckler and Pierrick Fedrigo (both BBox Bouygues Telecom). It was the best haul since 1997. 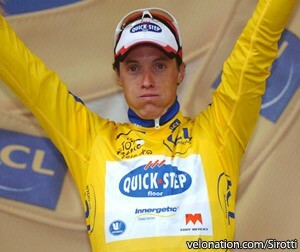 Chavanel also spent two days in the yellow jersey and won the most aggressive rider trophy, while Anthony Charteau (BBox Bouygues Telecom) took the King of the Mountains award.